Does your company have a mascot? Ours does. And ours writes Eclipse plug-ins in addition to being a fearsome beast. Not that I’d normally call Roy fearsome. Formidable, yes, but not fearsome. He juggled flaming clubs on Brandon’s wooden back porch (“Don’t worry, it’s just fire”). I once saw him fixing an obscure bug in our Subversion/Eclipse integration while wearing the complete bear outfit. 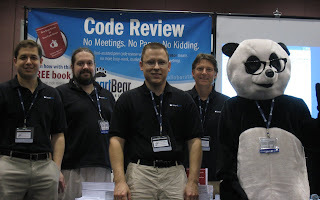 So what happens when you put an Eclipse developer in a panda suit and stick him in the aisle at SD West? Most people gravitate to the bear. Gotta see what this is all about. Usually they are smiling. People assume you’ve hired some poor high school student to stand around in the suit. So when the bear engages you in a discussion of peer code review you might be surprised enough to actually talk about it. The bear’s position in the aisle in front of the booth was unintentionally brilliant because: (a) you have to walk around the bear — the suit plus personal space creates a significant no-fly zone, plus (b) there was always a crowd around the bear, checking it out, seeing if it could talk, which increases the no-fly zone, therefore (c) if you want to get past the bear you must swing all the way to one side of the aisle (where our booth was) or the other, so (d) you end up getting our pitch and seeing our stuff even if you avoid the bear, especially since (e) the leftover space between bear and booth was so small that it created a logjam so you’d be standing in front of the booth without ability to move so you might as well check out our movie and get a free book. At least 10 other vendors at the show commented that “That guy must have lost a bet.” Sheesh. Roy really wanted to be the bear, and he was really good at it. He spent a lot of time in the bear head back at the office to get used to where the ears and head and eyes and chin were. If you cup the vestigial ears and bend them forward and say “come again,” no one considers that this action doesn’t actually allow the human to hear better. Not-so-clever Stephen Colbert references abound. Once the bear was propositioned. A woman commented that it would be great to have a bear mow the lawn. Roy said the bear was not for sale, but I thought he should have at least heard her out. Everything can be had for a price, even a mowing bear. Maybe not for Roy. Bears stand out at awards shows. Craig (as in, he has a list) mentioned the bear three times during the ceremony. Eric points out it worked because Roy was not jumping around, calling attention to himself. He was just calmly sitting there, as if it’s normal that a bear would be attending the Jolt Award. Which, of course, it is. P.S. Before you put 2 and 2 together, it turned out to not be a juggling bear. Roy couldn’t see well enough out of the… neck… to juggle. He actually got three balls going by throwing them back on his furry belly to reduce error, but it looked weird.